Making your own hours, showcasing beautiful homes, generous commissions — what job could be better? This intensive, 75-hour course will cover real estate laws, valuation, contracts, qualifying and financing the buyer, and more to prepare you for the Georgia Real Estate Salesperson Exam. Extensive reading and homework assignments will help you gain a full understanding of what it takes to be a real estate agent. Access to a computer and a valid email account outside of class is required to take homework exams. 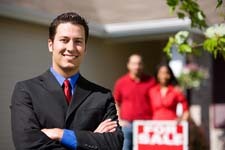 CSU is approved by the Georgia Real Estate Commission as a provider of real estate education. Textbook included. Please read: Introduction on 1/14. Midterm on 3/11, Final on 4/29, Retake on 5/2. Career night will take place 4/25. Classes will not meet on 1/26, 2/4, 2/7, 2/18, 3/25, 3/28.